Around 300BC, the Chinese and the Mongolians pickled cabbage to preserve it. Pickled cabbage was used to feed the workers as they built The Great Wall of China. It was over 1000 years later that it arrived in Europe having been carried by the Huns and the Mongol cavalcades. Sauerkraut arrived in the United States in the mid-1800's being brought by German immigrants. During World War I, due to fears that German products would be rejected by American consumers, makers of sauerkraut in the U.S. re-named the product "Liberty Cabbage." 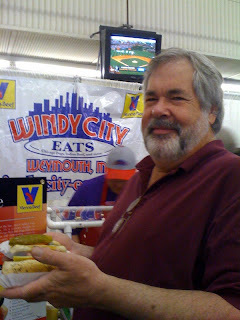 As near as we can tell (although it is disputed) the hot dog was first created in the late 1400's. The obvious question...What did they do with all that sauerkraut (for nearly 2000 years) until the hot dog finally came along? I have no answer, I can't imagine. The important thing is you'll have to remember to try the Bacon and Kraut Dog at Yank's Franks. It'll be served with spicy mustard and it will leave you with only one regret. You will wish you ordered two of them. Frankly, we (will) serve the BEST dogs! The first phase of construction to convert our little building into Yank's Franks, the very best "Hot Dog Joint" will soon begin. 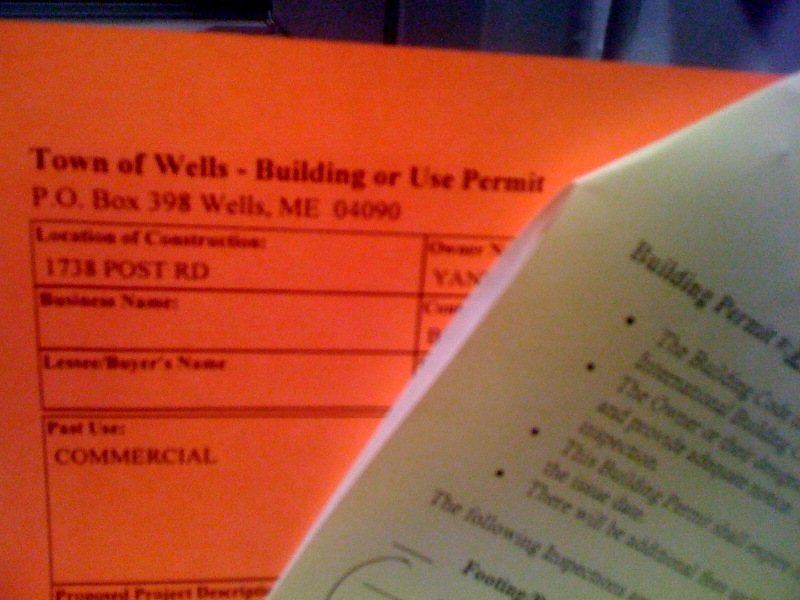 A building permit is in hand and work will begin any day now. Phase two of the building transformation is also around the corner. However, we have not yet applied for the permit for this much more extensive chapter of the conversion. We are hoping the permit application will be submitted within the next week. Before you know it, Wells, Maine will be the Hot Dog Capital of the Northeast. The Hot Dog King and I set out on a mission yesterday. 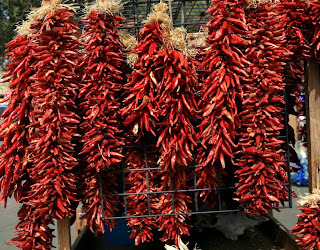 Knowing that Yank's Franks had yet to find the perfect chili, HDK suggested a visit to the best Mexican restaurant in the northeast. Because a great chili dog is a must at Yank's Franks, we went on the road again. Many of you are skeptical about the idea of great Mexican food in the northeast, let alone in Maine, but I promise you we have a fantastic (and authentic) Mexican restaurant. So, off we went to Loco Coco's Tacos in Kittery, Maine. Hot Diggity and I stumbled on this place several years back, when it looked more like a converted gas station (that's what it was) than a restaurant. We had recently moved to Maine from Texas (awesome Mexican food) and were jonesin' for Mexican food. We soon turned HDK and Double Dog Dennis on to this great find and they have since been several times. HDK and I each ordered a bowl of Chili. It was fantastic. It was the best chili I have enjoyed in a long time. 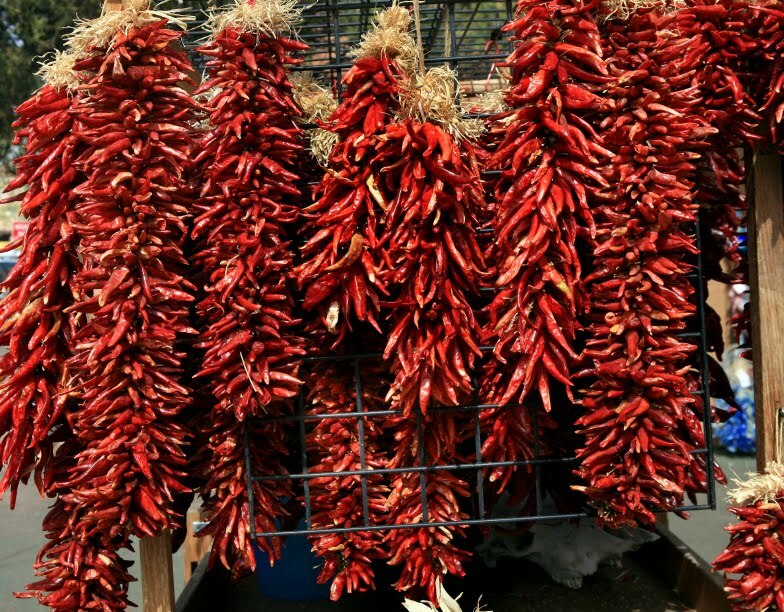 What about using this chili at Yank's Franks? Maybe! There are two issues: first, it had beans. Hot Dog chili typically does not have beans, and second, don't know if Coco Loco's Tacos sells their product for resale. If we decide to pursue this idea, we will inquire. To round out our Hot Doggin' trip, we stopped at a very popular Hot Dog Joint. We had heard so much about this place we had to try it (Hot Diggity and I had tried this place several years ago, but it was a first for The Hot Dog King). The Joint will remain unnamed as we came away with little positive to say. 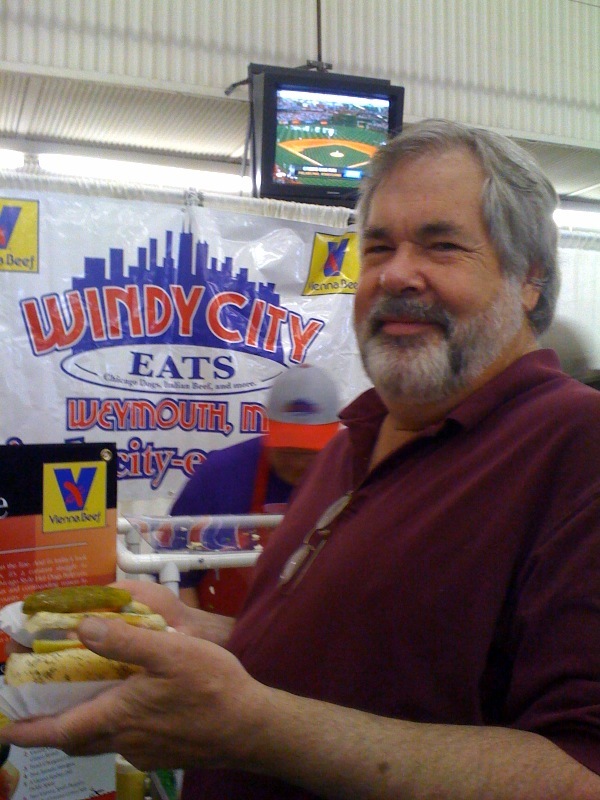 Yank's Franks will strive to provide much better food and a much better experience for our customers. Hot Diggity and I rose at dawn's first light. We each dressed in Khaki clothing and I put on my pith helmet, Hot Diggity chose her slouch hat. We were heading out for the big prize, the "Trophy" hot dog. We went on a Hot Dog Safari. 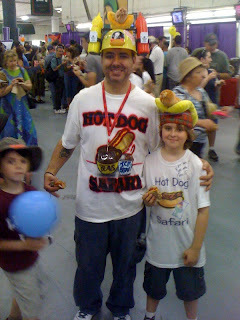 Don't complain, we told you all about it in our May 9th post, You Can Attend The 2010 Hot Dog Safari. Most safari's will take you to a variety of exotic places in Africa, The Hot Dog Safari wasn't safari away (that never gets old), it was just down the road in East Boston. As you can see from the photo to the left, it was a family event and fun for all ages. In the photo to the right, you see Hot Diggity as she was being mauled by some sort of deep forest creature. If Just Plain Sophia was along she would have undoubtedly tried to kiss the creature in hopes of turning him into a handsome prince. There were hot dogs everywhere you turned. The estimate of 30,000 attendees was likely exceeded (that's why we went early, they still had plenty of dogs). There was ice cream and cold drinks to wash down the dogs. The Grand Marshal was Senator Scott Brown, but the only celebrity I saw was Hot Diggity, and I got her autograph (personalized). Truth be told, the event was nowhere near the fun of the recent 2010 Hot Dog Jamboree, but they will try again next year. As for that "Trophy" hot dog, they were all delicious. 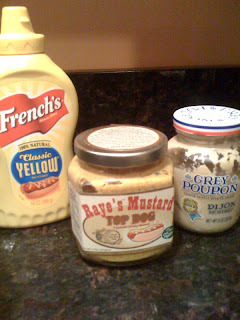 The Mustard War is Over ~ Hot Dog!...Who Won? The French used to crush up these spicy seeds and mix them with the unfermented juice of wine grapes which was known as Must. The Latin term from which the name mustard is derived is mustum ardens which translates to burning must. Back to the Yank's Franks mustard war. While I expected Yellow Mustard (like French's) and Spicy Brown Mustard (like Gulden's) to be the leading candidates, I didn't think they'd end up in a tie. No need for concern, Yank's Franks will have both types of mustard on hand to satisfy the tastes of all you Hot Doggers out there. My favorite? ~~ it depends on the hot dog. On the Yank's Franks version of the Chicago Dog, I'll take Yellow Mustard. On my current favorite hot dog (I change favorites quite often), a hot dog with bacon, and griddled sauerkraut, I like the spicy mustard. This hot dog is soooo gooood! I gotta go, I'm getting hungry. Don't forget to vote in the current poll. Before you know it, you'll be enjoying the best hot dogs you've ever had. Since our last post, we have had six meetings with general contractors (and their subcontractors), we have met with the Wells Fire Department twice (the first meeting was interupted by a fire, not at Yank's Franks) and we have had two meetings with the Wells Code Enforcement Department. We have also attempted to meet with the Coca~Cola representative (which leads us to our new poll question, please vote) and we had a great follow up meeting with our banker, Dill Relish Rick. That's right, our banker now has a hot dogger name. 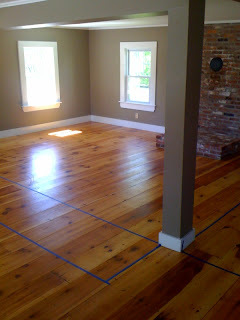 Our plans are coming together nicely, so I thought it would be a good time to post the "before" photos of our soon-to-be hot dog joint. We expect to be choosing a contractor within the next week. Construction could begin as early as the first week of June (we're optimists). My mouth is watering just thinking about those dogs. Frankly, we (will soon) serve the BEST dogs! A Yank's Franks ~ Hot Dog Bulletin! BREAKING NEWS!!!!!! 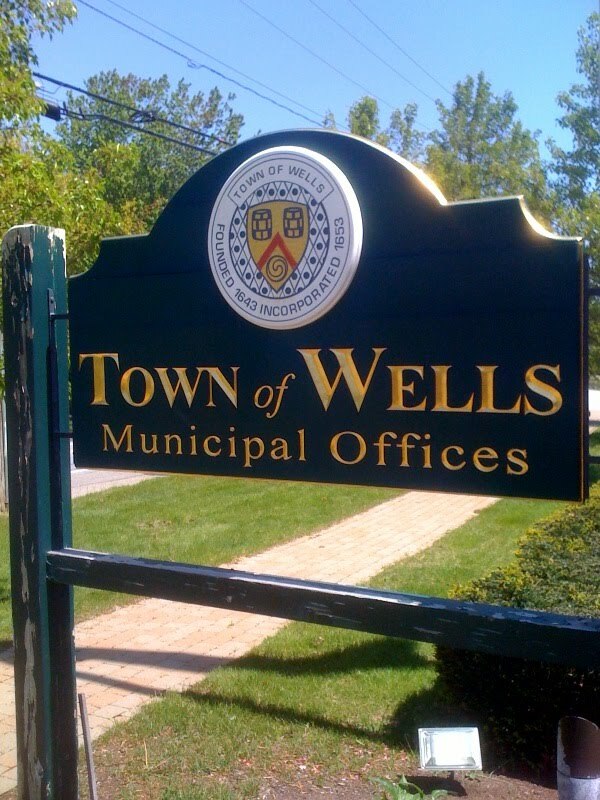 ~ The Town of Wells has approved the Yank's Franks site plan. It was one of the big hurdles in our efforts to open Yank's Franks. Thanks to the assistance of some great folks at Wells Town Hall everything went smoothly. 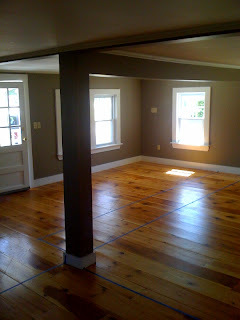 The next step is to choose a builder and turn our neat little building into a "Hot Dog Joint." I've been flooded with emails and phone calls from people (hotdoggers) from all over the world (yes, the world). Everyone is upset that I gave them no advance warning that the 2010 Hot Dog Jamboree was being held. Well, I'm determined to never make that mistake again. Bigger than The Jamboree is the Hot Dog Safari! You have all undoubtedly heard of the Phantom Gourmet He's the guy that I used to pretend to be, so I could get free food (just kidding Mr. Gourmet ~ however, I do love your sister, Eatie Gourmet). The Phantom Gourmet and the Andelman family (us New Englanders all know Eddie Andelman, one of the greatest radio hosts in history) team up to host this wonderful event with all proceeds going to The Joey Fund and to The Cystic Fibrosis Foundation. This event has been held since 1989 and each year gets better and better. Organizers of the event are expecting 30,000 people to attend this year. It will be held on Sunday, May 23rd at Suffolk Downs. Each of you have plenty of time to get your airline tickets. 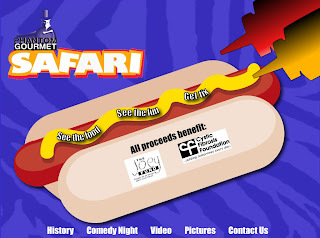 You'll save $5 by ordering your Hot Dog Safari tickets in advance. Polish Dog Damian should be coming in from Poland, I know Chicago Dog Debbie will be in from Chicago (bring Jumbo Dog Jim too, Debbie). You'll certainly have a chance to meet Double Dog Dennis and The Hot Dog King. And, there are rumors that Spicy Mustard Mama and Top Dawg Dada will be there with Just Plain Sophia and Mad Dog Miles. There is a possibility of seeing Deputy Dawg Dan and Spicy Salsa Marjan all the way from Texas. No question about Hot Diggity and me (we may be traveling in the Hot Dog Mobile). So you see, all the major Hotdoggers will likely be attending this worthwhile epicurean delight. 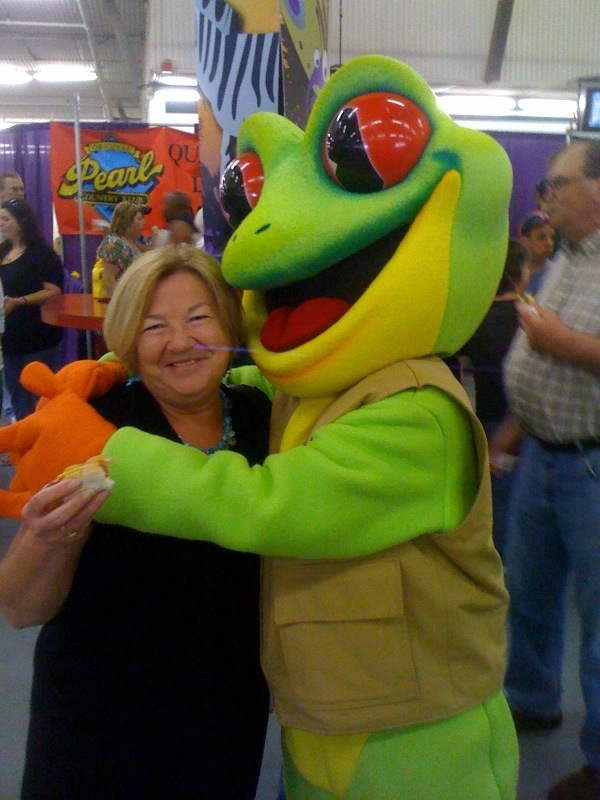 You all have advance warning, and I have already sent warning to the organizers of the Safari that I'll be there. If they think 30,000 Hot Dogs will be enough, they're nuts. Hot Diggity and I are going to The 2010 Hot Dog Jamboree. Tomorrow evening we are going to a shindig being hosted by The Hot Dog King and Double Dog Dennis, two of the finest connoisseurs in Southern Maine. On the menu are hot dogs and hamburgers with all types of scrumptious toppings, as well as some super-duper side dishes. This event is expected to be well attended by hot dog lovers from all over the state. Your votes are in for your favorite Potato Chips. Plain old Salt took the cup by a nose (today is the Kentucky Derby and I'm getting in the mood), but close behind in the place position is the Salt & Vinegar chips. Several furlongs behind finishing in the show position is Sour Cream. Not surprising results. I suspect if we had more "Mainers" voting, Salt & Vinegar would have been the odds on favorite. The true Mainers put vinegar on their French Fries. 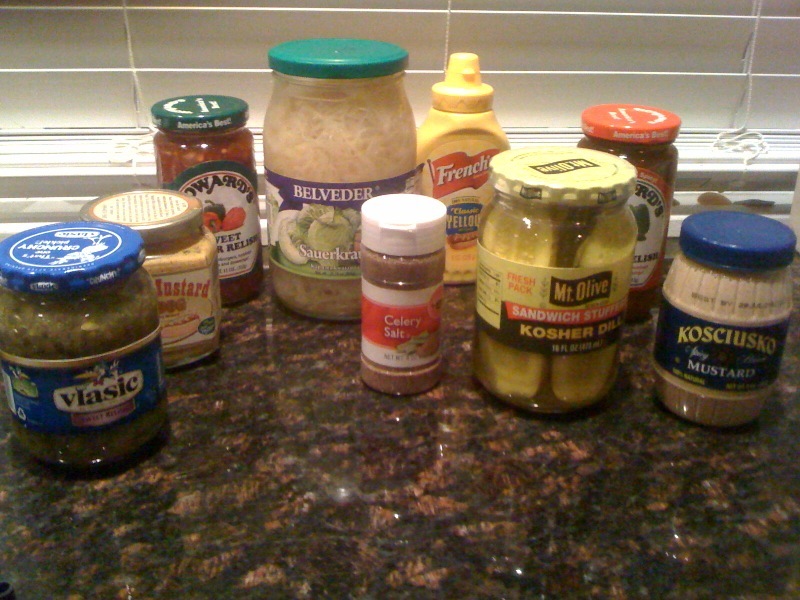 Okay, time to move on to a very important subject, Mustard. Make your choice to take the ribbon. Undoubtedly, this race will be down to the wire.